View of the cistern from the northeast corner. a man-made spring from which water flows under natural pressure without pumping. 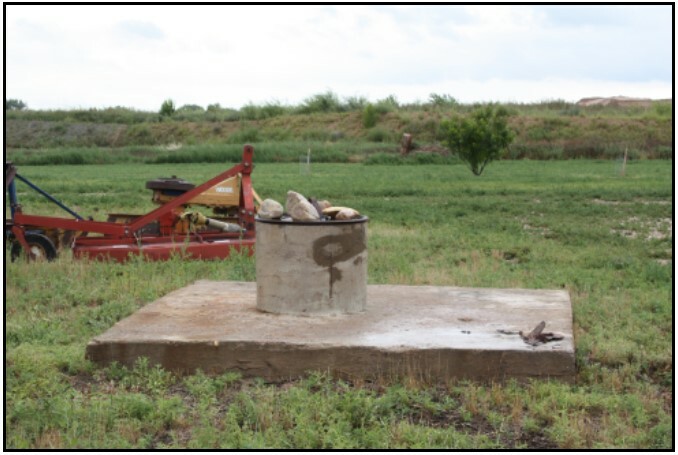 An aquifer provides the water source for an artesian well. It is unknown when the artesian well first came into existence on the property. It is possible that well water supplied the original house on the property (which was moved across the road). In 1922, the Von Trothas added the cistern and ran a pipe from the well to the cistern. This possibly supplied water to that first house. When the main stucco farm house was built in 1926, a pump was connected to the artesian well to pump water directly into the house. The artesian well has been plugged, but water still leaks from the well. After the chicken house was destroyed by the micro-burst in 2012, the “mini-wetland garden” formed in part of the area where the chicken house was located. Part of the chicken house also landed on the cistern, damaging the top of it. Activity: What wetland plants do you see growing in the “mini-wetland garden”?